George Gershwin (September 26, 1898 – July 11, 1937), one of America's most well-known composers and pianists, used a working man's music to influence the kings and queens of Broadway and Hollywood. Integrating and harmonizing the profound elements of classical music stylism and the robust sounds of American jazz, Gershwin created a musical style that elevated the life and ideals of the common man to the venues of the elite concert stage, made the music of jazz acceptable to the realms of classical followers, and initiated American music into the concert repertoire. He was born Jacob Gershowitz in Brooklyn, New York to Russian Jewish immigrant parents and wrote most of his works together with his elder brother lyricist Ira Gershwin. Gershwin composed both for Broadway and for the classical concert hall. He also wrote popular songs with success. Many of his compositions have been used in cinema, and are recognized jazz standards; the jazz singer Ella Fitzgerald recorded many of the Gershwins’ songs on her 1959 Gershwin Songbook (arranged by Nelson Riddle). The very greatest singers and musicians have recorded Gershwin songs, most notably Frank Sinatra, Billie Holiday, Miles Davis, John Coltrane, Herbie Hancock and countless others. Gershwin's music exudes the power of spring-like hope. Unlike so many of the artistic elite, he never lost sight of the importance of familial values and placed them at the core of much of his music. Gershwin's "grand jazz opera" Porgy and Bess is arguably the finest example of the synthesis of Jazz and Classical idioms. As music journalist Alex Ross notes, Porgy and Bess performed the monumental feat of reconciling the rigidity of Western notated music with the African-American principle of improvised variation. In the end, Gershwin reunited two sides of the composer's job that should never have been separated to begin with, and he came as close as any composer of the day...to the all-devouring, high-low art of Mozart and Verdi." In 1910, the Gershwins acquired a piano for Ira's music lessons, but younger brother George developed a greater affinity for the keyboard and soon took over the instrument and the lessons. George would hear new songs at school and on the radio and then try to duplicate the various melodies and harmonies that he heard at his home on the piano. His ability to play "by ear" earned him early piano lessons. He tried out various piano teachers for two years, and then was introduced to Charles Hambitzer, who acted as George's mentor until his death in 1918. Hambitzer taught George conventional piano technique, introduced him to music of the European classical tradition, and encouraged him to attend orchestral concerts. George later studied with classical composer Rubin Goldmark and avant-garde composer-theorist Henry Cowell. His first job as a performer was as a "piano pounder" or rehearsal pianist for Remick's, a publishing company on Tin Pan Alley in New York City. He was thus exposed to the many songs and compositions that were submitted to be published. This experience honed his ability to determine what music could be successful or not. His 1916 novelty rag "Rialto Ripples" was a commercial success, and in 1918 he scored his first big national hit with his song "Swanee." In 1916 he also recorded 14 piano rolls, including six pieces of his own compositions for the Welte-Mignon of M. Welte & Sons, Inc., of New York City, the inventor and first producer of reproducing pianos. In 1924 Gershwin was commissioned by conductor Paul Whiteman to compose a unique symphonic jazz piece for his band. George was so busy with his musical schedule that he forgot about the commissioned piece until he saw an advertisement for the band concert. With a little over two weeks until it was premiered, George depended on his prolific compositional background and composed the “Rhapsody in Blue,” a piece which singularly defined his extraordinary talent. Also in 1924, George and Ira collaborated on a musical comedy, Lady Be Good. It included such future standards as "Fascinating Rhythm" and "The Man I Love." This was followed by Oh, Kay! (1926); Funny Face in (1927); Strike Up the Band (1927 & 1930); Girl Crazy (1930), which introduced the standard "I Got Rhythm"; and Of Thee I Sing (1931), the first musical comedy to win a Pulitzer Prize. Gershwin stayed in France for a short period of time where he wrote "An American in Paris." This work received mixed reviews but was a landmark piece in replicating the many sounds and sights of Paris. Eventually he found the European music scene too supercilious and returned to America. While in California, Gershwin began having trouble with headaches and difficulty remembering the scores and certain passages in his compositions. He was encouraged to seek medical help, and was soon diagnosed with a brain tumor. Gershwin was in Hollywood writing the score for The Goldwyn Follies on July 11, 1937, when he collapsed and died of a brain tumor at the age of 38. He was interred in the Westchester Hills Cemetery, Hastings-on-Hudson, New York. Gershwin was very close to composer Kay Swift and he consulted with her on many of his song arrangements. He named the musical Oh, Kay after her. Posthumously, Swift arranged some of his music, transcribed some of his recordings, and collaborated with Ira on several projects. He also greatly admired Simone Simon who encouraged him in his works. Gershwin died intestate (without a valid will), and all his property passed to his mother. The Gershwin estate continues to bring in significant royalties from licensing the copyrights on Gershwin's work. The estate supported the Sonny Bono Copyright Term Extension Act because its 1923 cutoff date was shortly before Gershwin had begun to create his most popular works. The copyrights on those works expire in 2007 in the European Union and between 2019 and 2027 in the United States of America. Gershwin was very much influenced by French composers of the early twentieth century. When Gershwin met famous composer Maurice Ravel, he asked to become a student of composition under the master. Ravel is said to have replied, "Why should you be a second-rate Ravel when you can be a first-rate Gershwin?" Ravel was already quite impressed with the ability of Gershwin, commenting, "Personally I find jazz most interesting: the rhythms, the way the melodies are handled, the melodies themselves. I have heard of George Gershwin's works and I find them intriguing" (Mawer 42). The orchestrations in Gershwin's symphonic works often seem similar to those of Ravel; likewise, Ravel's two piano concertos evince an influence of Gershwin. He also asked Igor Stravinsky for lessons; when Stravinsky heard how much Gershwin earned, he replied, "How about you giving me some lessons?" Gershwin's own Concerto in F was criticized as being strongly rooted in the style of Claude Debussy, more so than in the expected jazz medium. The comparison didn't deter Gershwin from continuing to explore French styles. The title of An American in Paris reflects the very journey that he had consciously taken as a composer: "The opening part is developed in typical French style in the manner of Debussy and the Six, though the tunes are original" (Hyland 126). Gershwin was intrigued by the works of Alban Berg, Dmitri Shostakovich, Igor Stravinsky, Darius Milhaud and Arnold Schoenberg. As his teacher of composition, the Russian Joseph Schillinger exercised considerable influence on him, providing him with a method to his own composition style. After the posthumous success of Porgy and Bess, Schillinger claimed he had a large and direct influence in overseeing the creation of the opera; Ira completely denied that his brother had any such assistance for this work. In analysis, Schillinger's student Vernon Duke found that while many of Gershwin's works certainly were reviewed by Schillinger, Porgy does not seem to have been one of them. The indirect influence of his study with the teacher was apparent in the opera's even more clear orchestrations, but it is characteristically Gershwin in ways that Schillinger would not have approved (Hyland 167). What set Gershwin apart was his ability to weave disparate forms of music into his own unique voice, creating a distinctive style that listeners loved with great passion. He took the jazz medium which he discovered on Tin Pan Alley into the mainstream by splicing its rhythms and tonality with that of the popular songs of his era. 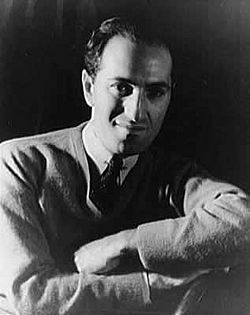 George Gershwin will continually stand as one of America's most outstanding composers. Second Rhapsody (1932), for piano and orchestra, based on the score for a musical sequence from Delicious. Working title for the work was Rhapsody in Rivets. The form most commonly heard today is a re-orchestrated version by Robert McBride; most of Gershwin's orchestrations have been simplified. Also, eight measures not by the composer were added to the recapitulation. Michael Tilson Thomas has been a promulgator of Gershwin's original version. Porgy And Bess (1935), a folk opera from the book by DuBose Heyward about African-American life, now considered a definitive work of the American theater. Contains the famous aria “Summertime,” in addition to hits like "I Got Plenty of Nothin'" and "It Ain't Necessarily So." Porgy and Bess has also been heard in the concert hall, mostly in two orchestral suites, one by Gershwin himself entitled Catfish Row; another suite by Robert Russell Bennett, Porgy and Bess: A Symphonic Picture is also relatively popular. Walking the Dog (1937), a humorous piece for orchestra featuring the clarinet. It was originally a musical sequence from the 1937 film Shall We Dance, featuring Ginger Rogers and Fred Astaire. Many other incidental sequences from the film were written and orchestrated by Gershwin, among them: Waltz of the Red Balloons and a final extended eight-minute orchestral passage based on the title song with an intriguing coda hinting at Gershwin forging a new musical path. It is unknown why any of these compositions have not seen the light of day in the concert hall. Most of the musicals Gershwin wrote are also known for their instrumental music, among them the March from Strike Up The Band and overtures to many of his later shows. 1923 - The Rainbow (lyrics by Clifford Grey). Premiered in London. 1924 - Primrose (lyrics by Desmond Carter). Premiered in London.